Sentencing has been continued for at least another month for a Sun Valley man who earlier pleaded guilty to aggravated assault for pointing a gun at a well-known local attorney and attempted strangulation against his girlfriend. Both crimes are felonies in Idaho. 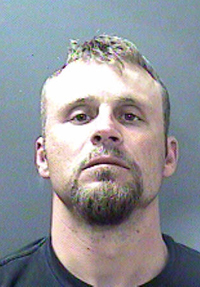 John Terrill Harbeck, 37, appeared briefly Monday morning in Blaine County 5th District Court for sentencing for the two crimes. However, the hearing only lasted about five minutes, after defense and prosecution counsel and the judge agreed that more information is needed on Harbeck’s mental condition. An evaluation was ordered by the court. Sentencing was rescheduled for May 19, which is exactly a year from when Harbeck committed his crimes on May 19, 2013. Sun Valley police reported then that Harbeck first strangled his girlfriend in an Elkhorn Village condominium, then followed her to her car and pointed a gun at her and Hailey attorney Douglas Nelson, who happened to be riding a bicycle through the village at the time. Harbeck eventually returned to the condominium, Unit 50 in Building 3. Alarmed about the gun incident, Sun Valley Police Chief Walt Femling asked for assistance and about 20 officers from various agencies surrounded the area, evacuated the building and closed the road into Elkhorn Village before Harbeck surrendered peacefully at about 10 p.m.
Harbeck has remained incarcerated in the Blaine County jail on $200,000 bond since the incident. He pleaded guilty to both crimes in January. In exchange for the guilty pleas, a third felony charge of possession of a weapon by a convicted felon is being dismissed. Since Nelson, a victim in the crime, is well-known in legal circles in southern Idaho, the case was eventually assigned to Senior Judge Darla S. Williamson, a retired district court judge from Boise. Harbeck is represented by Idaho Falls attorney Neal S. Randall.